This week we have two featured events. The launch of the Dawning by Robert C. Fitzgerald and the Graduation of our Summer Reading Club. 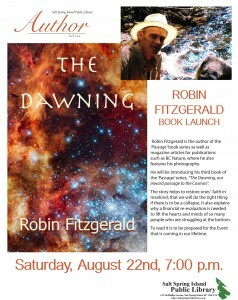 Join us on Saturday for the launch of The Dawning by Robin C. Fitzgerald. “The Dawning, our inward passage to the Cosmos” is his third book in the Passage series. This story helps restore one’s faith in mankind, that we will do the right thing if there is to be a collapse. It also explains why a financial re-evaluation is needed to lift the hearts and minds of so many of us struggling at the bottom. To read it is to be prepared for the Event that is coming in our lifetime. All children who participated in Summer Reading Club are invited to bring their families for an end of summer graduation party. Enjoy cookies, juice, and be awarded a special Summer Reading Club medal. Friday, August 21, 10:30 am.